AT&T Office@Hand Skype for Business app Overview allows you to make and receive Office@Hand calls, send and receive SMS texts, initiate Office@Hand online meetings and audio conferences. Follow the steps below to learn more about making a Conference call on the Office@Hand app for Skype for Business. Note: You can also use the Conference with Office@Hand option from the Skype for Business contact menu. 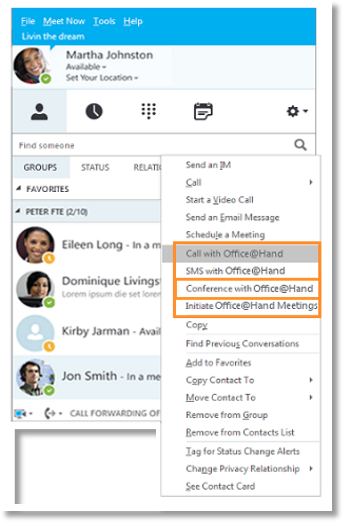 If you go directly to the Conference tab in the Office@Hand for Skype for Business app, you will be allowed to enter multiple valid phone numbers to send the conference invite with SMS. If you right-click on a Skype for Business contact and select Conference with Office@Hand, the contact’s Skype for Business ID and phone numbers saved in both Office@Hand and Skype for Business will be populated in the drop-down below the To field in the Office@Hand for Skype for Business app. If the selected is a Skype for Business ID, then the Skype for Business message window will be invoked, with the conference invite info displayed; and the mini app Call page will be displayed with the conference dial-in number dialed. If the selected is a phone number, then the conference invite will be sent via SMS and the mini app will dial the conference dial-in number. Note: If you have no access to Office@Hand Conference Service, the app will prompt you about not having access to this feature.